Most of us are not completely aware of the critical differences between Auto Detailing and commercial car washes. Some car owners feel as though having their car washed at a commercial car wash is the same thing as having a professional completely detail it. Although the intent is the same (to get your car clean and shiney! ), there are some pretty major differences in cost, quality and other variables. As you’re familiar with, when you go to a commercial car wash, your car will go through a tunnel where mechanized clothes, brushes, water jets, and/or detergents wash your car. Once your vehicle passes through the car wash, some washes may have staff who will dry off your vehicle – others, with air dryers. Some places will offer interior services after they have washed your car. Interior services usually include a vacuum and wipe down of the inside of your car. Usually, this entire process is done in a relatively short amount of time at a relatively low cost. But with such little time being spent on the vehicle, the details (pun intended) can often be missed. An automated car wash, in some cases, can damage paint, rims, mirrors, wipers, antennas and more! The mechanical brushes, stiff bristles, aggressive air dryers and automated vehicle conveyors are some of the culprits that can cause such damage. Secondly, if the staff is working quickly cleaning/drying one car after another – they may not switch their towels often thus causing damage from cross-contaminates. Not all car washes will cause damage, but some may say their is more risk of serious vehicle damage by using such a service. When you go to a professional auto detailing shop your car is more than likely going to be hand washed with each and every inch of the vehicle being scrutinized from bumper to bumper. An individual carefully washes each area of your car with their hands – there won’t be any automation here. Some of the key focus areas include wheels, wheel wells, paint, interior, tires, glass – the whole nine yards. After the car has been washed, fresh, premium terry cloth/towels are used to wipe it down to ensure no scratches will occur. Once the washing process is complete, the person will begin further detailing of your car. This consists of your paint being waxed by hand, polished, and sealed to protect and shine the vehicle’s exterior. It is true, that sometimes car washes will offer their customers polishing and waxing services and some other ‘detailing services’ but this is usually not as complete and detail oriented as a true Automotive Detailing Shop. When you have the interior of your car detailed professionally, the same care of the exterior will go in to the car’s interior. Brushes and vacuum attachment parts are used to make sure that cracks and crevices can be accessed and cleaned. Detailers pay special attention to hard surfaces, such as plastic, leather, and vinyl using effective, non-damaging cleaners/tactics. 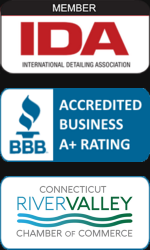 Detailers who take great pride in their work will take the time to become IDA Certified (International Auto Detailing Association) to implement expert cleaning tactics when your vehicle. You would be surprised what a non-experienced detailer can do to your car. You will end up buffing out damage paint – or worse! Therefore, be sure to think twice about who is cleaning and washing your car! In conclusion, a professional car detailer will likely spend more time beautifying your car, by focusing on each and every single inch of your vehicle, often times spending 4 to 6 hours instead of an automated car wash of a few minutes. Having your car detailed benefits you by enabling your car to look brand new for years without the risk of harsh cleaning and machinery. Have questions about cleaning your car? Contact M&M Auto Detailing today! I’ve been looking into deciding whether to get a car wash or auto detailing but I’m not sure how to go about it. I like what you said that when you choose to auto detail the car is more likely to be hand washed with each and every inch of the vehicle. This is good to know, thanks for sharing!